The Christian faith proclaims a standing invitation to a grand and glorious banquet. But those who wish to attend this feast must first be washed. This washing is declared by the clean water of baptism. After we are washed, we may sit down at the Lord's Supper, consisting of red wine and broken bread. An invitation to this banquet is too gracious to be dismissed out of hand, and it is too profound to accept glibly. The Christian faith is a serious and demanding religion, founded on the gladness and delight of God. As a faith, it is an all-encompassing worldview which cannot be reduced to cute little slogans. 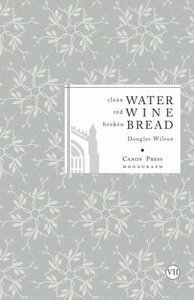 About "Clean Water, Red Wine, Broken Bread"